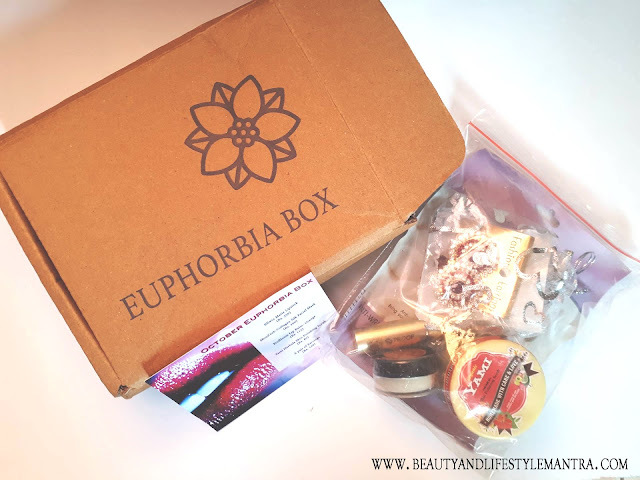 Today I'm going to unboxing and review the much-awaited and the most affordable beauty subscription which is now available in India, called Euphorbia Box. It was launched 1st October 2017. If you're on the hunt for skin care product, makeup and jewelry piece but you're on a budget, then this beauty box definitely for you. Their first October Edition as it's full of some good quality products. Subscribers are given ₹198/- only per month to have this box (shipping is 12 INR). Every box has products worth ₹865/- whereas first 10 subscribers will get products worth ₹1365. 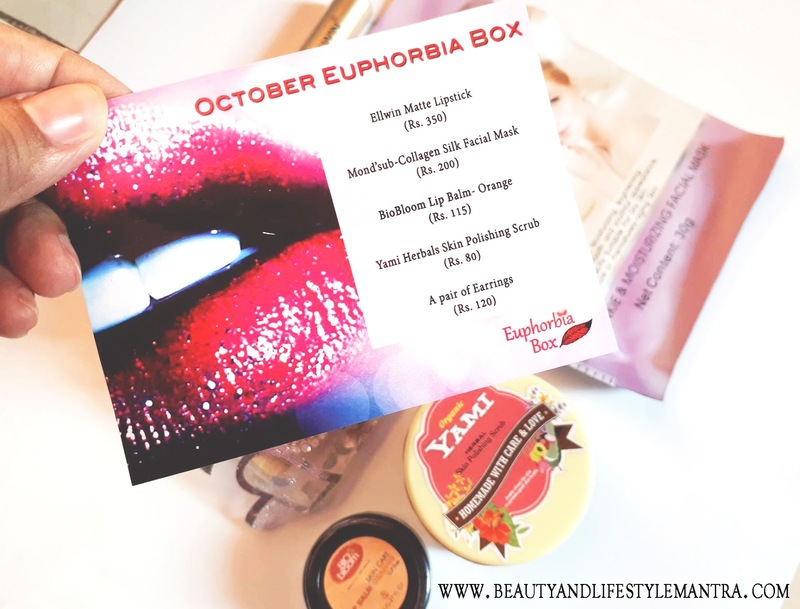 Euphorbia beauty Subscription box is a monthly subscription box. Every month they will send you some very useful personal care, makeup and piece of jewelry that match to your taste. You cannot opt for customization. Everyone will get the same piece of jewelry with a little bit of changes in colors and designs, otherwise worth of the box will be equal to all. The first thing that I have noticed, I received two skin care products and two lip products. Skincare products are Collagen Silk Facial Mask and Yami Herbals Skin Polishing Scrub. 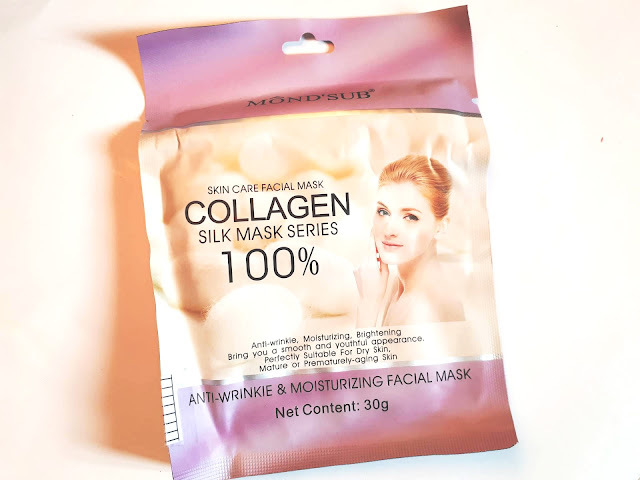 Collagen Silk Facial Mask is designed to treat anti-wrinkle, moisturizing, brightening skin and it is perfectly suitable for dry skin. Looking forward to giving it a try. 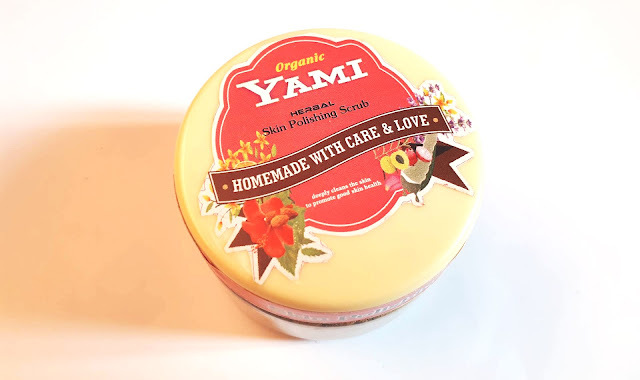 I'm a big fan of scrub and Yami Herbals Skin Polishing Scrub is a pure homemade product and free from any kinds of chemicals. I've heard a lot of great things about this so super excited to giving it a try. Next two products for the lip. 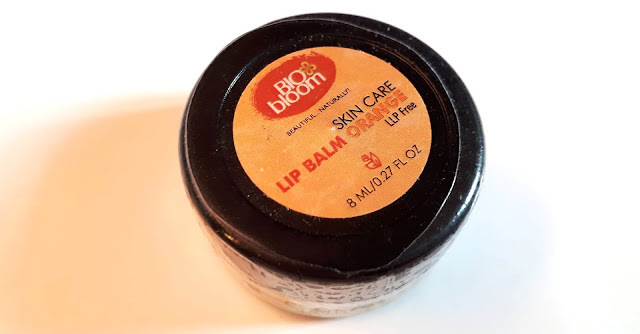 One is lip balm from Biobloom with orange flavor. The second one is the Lipstick from Ellwin. It is a beautiful pink color with matte finish. 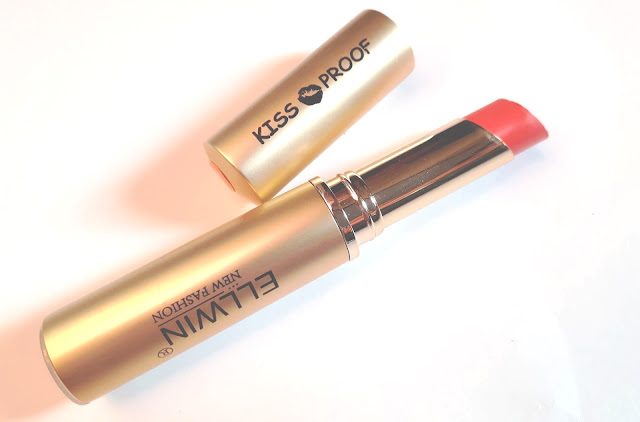 I'm thrilled to add a new brand to my growing Lipstick collection. The formula is quite good. Both the lip products have an amazing smell. The last one is a gorgeous pair of earring which is absolutely perfect for Indian ethnic outfit for any occasions and festivals. 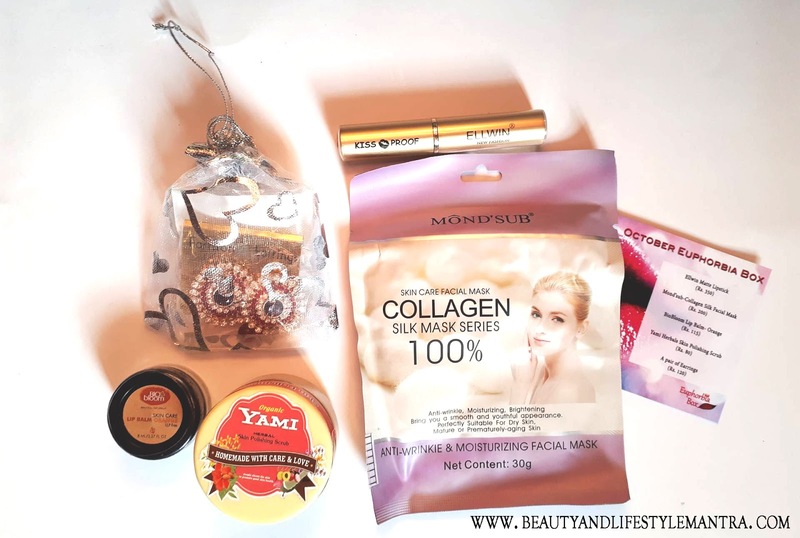 How to Subscribe this Beauty Box? Overall, I love this Euphorbia Subscription box. This box contains some good quality and very useful products with piece of Jewelry. Total cost of the box is ₹865/- but you will get this box at ₹198/- only (+ ₹12 shipping) which seems fair to me for the quality of the prodcuts. It's definitely worth buying. Do you subscribe this box? Gosh there are so many boxes these days, it makes it tough to choose just one. Is this available in the US as well? Euphoria box looks interesting especially the piece of jewellery looks great. I have never subscribed to any boxes before but this one is affordable too. Euphorbia box has great products! Must feel like christmas everyday receiving the box! To baf tht they dont deliver it outside India! The box is definitely very affordable. I'd love to give it a try. this box is really amazing.. It's wBr affordable and get so good products.. The box is looking damn affordable... So many stuffs inside... Loved it.. Seems an amazing Subscription box. Lip shade looks very nice and gorgeous. 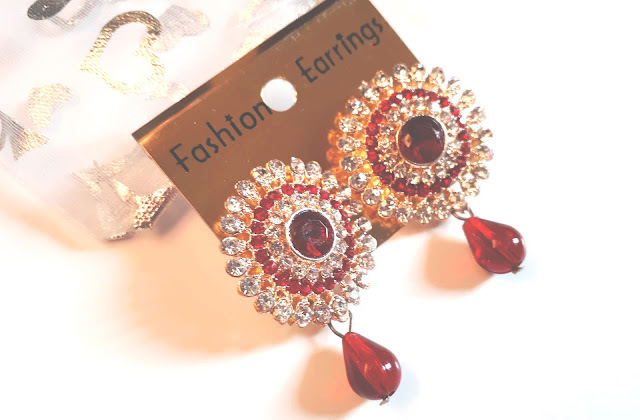 Earrings looks very beautiful. This Box got some amazing set of products. I loved it.. This is a very affordable subscription box and has good products. I love the sheet mask! Indeed it is very affordable. I liked the earrings you have got. Even the lipstick shade is very pretty. Subscription boxes seems to be in trend these days. I wish to also get these subscription. This review seems to be quite helpful in deciding upon subscribing. This is for sure an affordable subscription box with so many products.